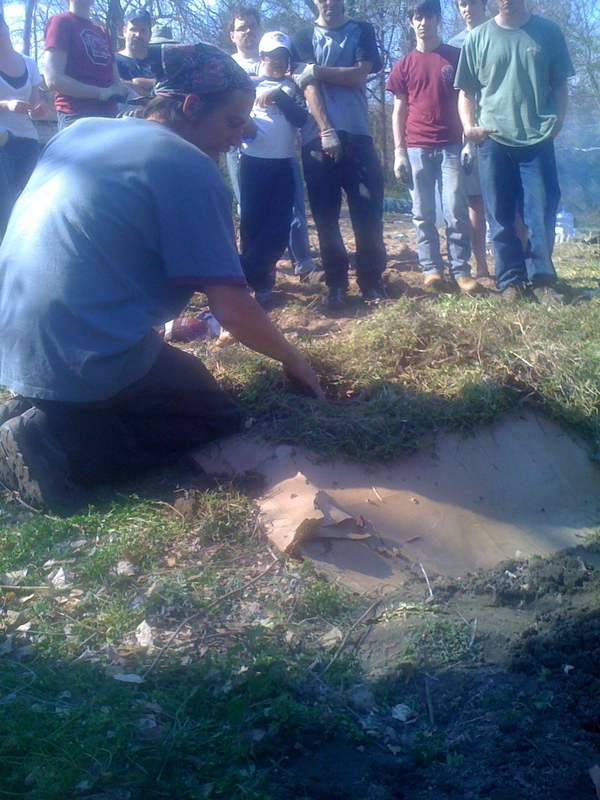 Last Saturday, the class went to Dalzell SC to plant a very large garden and till up 1/3 of an acre plot for Charleston’s Food Not Bombs chapter. This was the one of the SERVICE LEARNING components of the class. It provided a perfect nexus for the themes that we are examining in the course; namely, sustainability, the relationship between agriculture and place, the relationship between agriculture and communities, the relationship between agriculture and local and regional history, and the relationship between agriculture and global trends in food production, energy, water and soil management, agribusiness and monocropping. Nicolas Rubin and his brother showed up from the FNB and Matthew Kipp, the Green Quad’s resident permaculturist, were on site to guide and direct us. The class put some serious back into ripping up weeds and tilling the plot in front of a small, broken down home that was built in the 1840s. About 2 acres and the house has been leased rent-free to the FNB. The FNB has slowly be renovating the house and planted a small garden of gourds and pumpkins last summer. The owners of the land (which in total is more than 90 acres used) have generously agreed to plow the remaining acre plus so that the FNB and the Arab food class can plant heirloom-emmer wheat, which Anson Mills in Columbia has promised to provide free of charge. Emmer is the ancient wheat naturally cultivated and originating in Iraq and Greater Syria. It also has a long history in South Carolina as it was one of the earliest and certainly most resilient wheat crops used in the South until the monocropping of cereals destoyed agricultural diversity in North America. After tilling the ground and doing some other chores around the grounds, trenches were dug and long mounts made to try to capture rainfall and also fight off the rapid and thick growing weeds. Matt and Nick came up with a plan on how to arrange the tenches and mounds. Then Matt gave us a demonstration on how to plant potatoes in mounds with thick covering as to maintain water from rainfall and conserve the soil while also giving the potatoes room to grow. In addition to the potatoes, we also planted garlic, ocre, radishes, bush beans, pole beans, and acorn squash. Most of these crops are not indigenous to the Arab world, they are now all a regular part of the Southwest Asian cuisine (except the squash). The food that will be harvested will be used in the FNB’s mobile “soup kitchen” that they run every Sunday in North Charleston. Much of the land remains tilled and ready to plant more seeds in a couple weeks when more members of the FNB can come out. There is also heirloom onions growing “wild” in the place where the old house used to have its garden. Matt has identified these onions as not being wild but in fact a domesticated onion that were probably planted when the house was still inhabited back in the 1950s. Some of these onions are the size of leaks and they are delicious. We had a small but delicious lunch of acorn squash and potatoes made on a make shift oven, put directly the fire. Also, as we drink Arab coffee every class, I wanted to show the students how I roast the beans on an open fire. Nick and some students also made tripod bean poles out of twine and sticks. The students, Matt, Nick, my son Shadee and Samantha’s wonderful parents must be commended. Everyone worked really hard and we accomplished in one day what would have taken the FNB some time to complete.